However, the principles behind it don’t just apply to a game of chance. For instance, someone could start a business, set up a fireworks stand, or try to sell blankets, jewelry, a painting, or a piano and predetermine that 100% will be given to the Lord. And if God ends up surprising them and blessing the business or the sale abundantly, all the better! 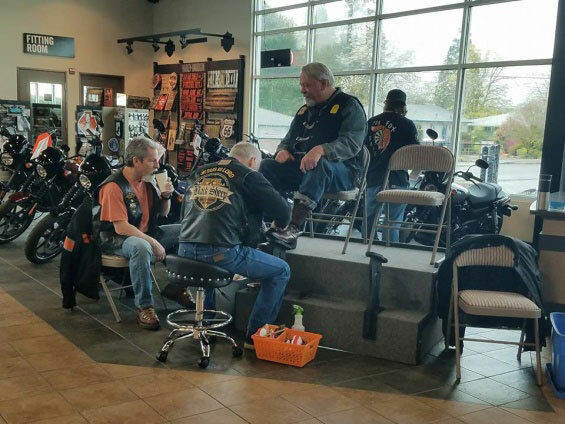 George Latus of Latus Motors Harley-Davidson in Gladstone, Oregon has been running a dice roll motorcycle giveaway for 20 years. Basically, you have to roll six giant dice that each have a Harley logo on all sides except one, which has a letter. The dice spell out Harley if all laid out letter side up. They were allowing the first 400 people to try to roll the complete word. It’s next to impossible. Most people don’t even have a letter come up. The chances to win were approximately 1 in 375,000. Before Rod and I went to the dealership that morning, we prayed together. We told Him we know He is in control of everything, even a dice roll. We told Him that if we won, we would donate all the funds from the bike, which retails for $20,000, to specific ministries. When it was Rod’s turn, he got the first letter. We cheered because, yay, he got a letter! But Rod knew after the first roll that God was doing something. Then boom, boom, boom—one letter right after the other. When Rod won the bike, it was a pretty big deal. This is the first time anyone has won, so everyone there was astounded and happy. And when some of the guys at the dealership found out Rod was donating this bike, he went from being a kind, well-liked guy to being a guy they don’t quite understand and who might be a little off his rocker! But to be honest, I’ve dragged my feet about writing out this simple story. Our desire is to make Christ known, and I don’t want it to seem all about US. Because it so is not. Another reason is that it never felt like our money to give. So how is that giving? It wasn’t sacrificial because God provided it by having Rod win the dice roll. Still, it was fun and exciting to be there, knowing without any doubt that God laid out each dice for Rod to win, so we could give that money to ministries. It was so moving to pray specifically and then have Him answer in such an obvious way. He is with us! He loves us! He has a plan for us! Although we’ve known all our money and assets come from God (especially in our business, where we thank Him for each job coming in and for how He has grown our business), this situation has made it even clearer. ALL our money and possessions are from God. Each client who calls, the lunchmeat on our sandwiches, each breath we take—all are specifically and thoughtfully from God. The rolling of each dice, as it landed on the needed letter, just highlighted this truth for us and reminded us of His daily providence: “And my God will supply every need of yours according to his riches in glory in Christ Jesus” (Philippians 4:19). So when Rod rolled and won, there wasn’t a moment’s hesitation about what would happen. We believe God had Rod roll those dice and win because He knew what we were going to do with it. Some of those who know us brought up the fact that we still have debt to pay off, as well as some house projects that need attention. They questioned whether we should give it all away. But we had prayed beforehand. How could there even be a question about what we would do with the money? 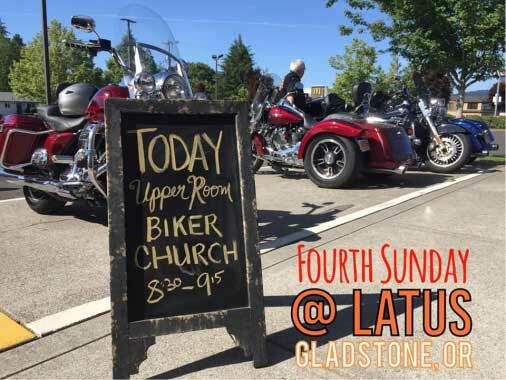 Earlier this summer, the Black Sheep were allowed to start a small biker church AT THE LATUS DEALERSHIP before the Sunday rides. A few of the Black Sheep had prayed for a long time for this to happen, and they were finally able to set it up. And the dealership is even advertising for the biker church on their website and Facebook page. A few nights after the giveaway, there was a Rose City HOG meeting, which we’re part of. It was a packed house and Rod was asked to come up and share about winning. He explained how we prayed beforehand and had promised the money from the bike would go to various charities if we won. He said he knew God had allowed this to happen. There was loud applause when he finished. There are so many other, small stories about individuals whose lives have been influenced by what has happened there recently. Giving away this bike isn’t just about the money. It has shown everyone, from the people who work at the dealership day in and day out and to the HOG members, someone who loves Jesus and loves them. Rod is being salt and light and also being a friend. The bike was never ours from the get-go. God made it crystal clear it was His. The money has been a tool to make God known—not just for the various charities that the money is going to, but also for those watching and being a part of the giveaway. It seems as if the impact of Rod winning the bike, and being obedient to give it away, was as valuable as the money itself. It was incredibly fun to watch and be a part of. And another thing happened: Rod was at a bike night in Gladstone, where hundreds of people gathered to see their bikes, eat, listen to music, buy Harley stuff, and visit. A motorcycle tire dealer was there and the big raffle prize was a new set of motorcycle tires. Rod was just talking to some guys about how he had another month or two left on his tires and would need a new set. I’m sure you know what’s coming, but Rod’s name was called and he won. He didn’t even hear his name; but everyone else did! So that could be the end of the story—sweet, Rod won some tires he needed. But it’s making us think....why? It could just be that God loves Rod and is gifting him with the tires. We’re sure that’s part of it. But there’s more. We’re certain. People are now coming up to Rod and literally rubbing his belly hoping for luck. He’s having amazing opportunities to explain that it’s not luck. He brings up the omnipotence of God and a verse we never thought to memorize: “We may throw the dice, but the Lord determines how they fall” (Proverbs 16:33). He tells them how God is present in every detail of our lives. We’re praying daily for God to bring opportunities to share the Lord with people. To sum it up: when we have seen God’s hand SO clearly, and knowing He had a plan for those funds, well, it is just plain exciting! 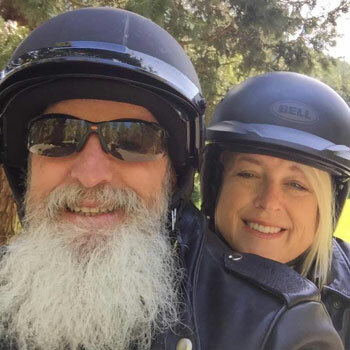 Which would we rather have: a 2018 Harley Fat Bob which will literally deteriorate and rust, even if we never rode it, OR the chance to have front-row seats as we pray over that money and watch what miraculous, life-changing, heart-softening, eye-opening, soul-shattering things God can do for His eternal glory? You know what we chose. Joyfully, and happily, with no second guessing or hesitation. We are blessed. For more on money, stewardship, and giving, see Randy’s books The Treasure Principle, Managing God’s Money, and Money, Possessions, and Eternity. Nanci and I love Mary Clayton Wood, now Mary Clayton Crow, one of our dear friends. Several years ago, M.C. shared at a Generous Giving Conference. I think you’ll find what she says in this excerpt from her testimony to be both encouraging and convicting. There’s greater wealth among God’s people, especially in the Western world, than there has ever been in human history. The question is, what are we doing with the wealth He’s entrusted to us?